At the beginning of a new year, many investors review what happened in the past year, searching for next year’s potential winners. Some investors believe the momentum from last year’s returns in an asset class will continue in the future, i.e, they buy into the concept of extrapolation. And this happens — sometimes. It’s known in the behavioral finance field as the hot hand fallacy. Nobel Prize winner Richard H. Thaler gives the example of a gambler who has won many hands in a row at the blackjack table and thinks his run of luck will continue. Or a basketball player who has scored five straight three-point baskets and fires up another because he thinks he can’t miss. Or more stock market-related, the investor who bought a dot-com stock in 1999 and thought it would keep going up forever. On the other hand, some investors are contrarians and think last year’s losers will become next year’s winners. And this also happens — sometimes. In common terms, this is the “last shall be first” or “every dog has its day” theory. For academics, it is known as reversion to the mean, where asset prices and historical returns eventually return to their long-term averages. However, as you can observe in the chart below, neither of these theories is consistently observable. In fact, there doesn’t seem to be a pattern; it all appears to be quite random. 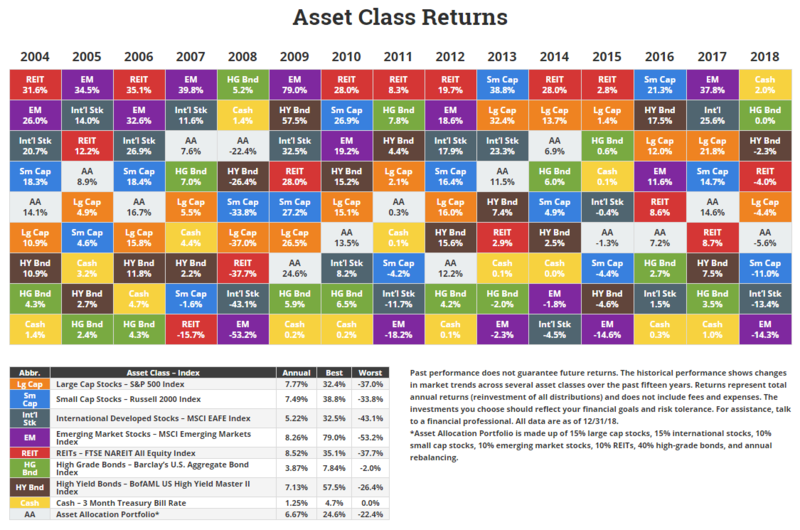 The first chart ranks the best to worst investments by asset class over the past 15 years. Hover over the table to highlight a particular asset class’ returns. How about international stock markets? Approximately 50% of all stocks are non-U.S. based, so these companies should be considered as a portion of your portfolio. The chart below documents each country’s performance. 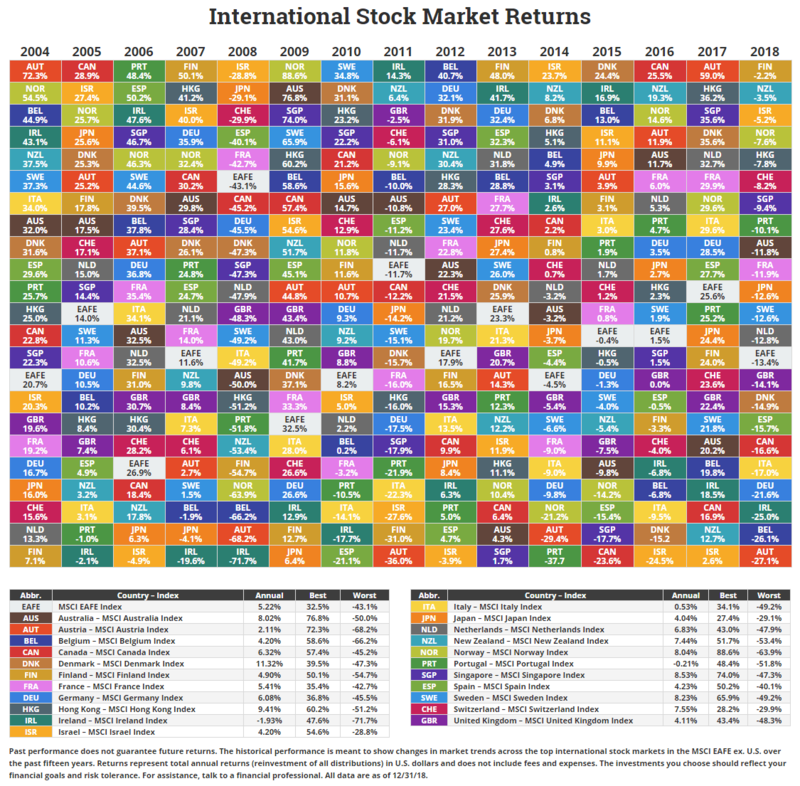 Once again, it’s hard to pick out winners and losers in advance, which is why holding a diversified portfolio makes sense. 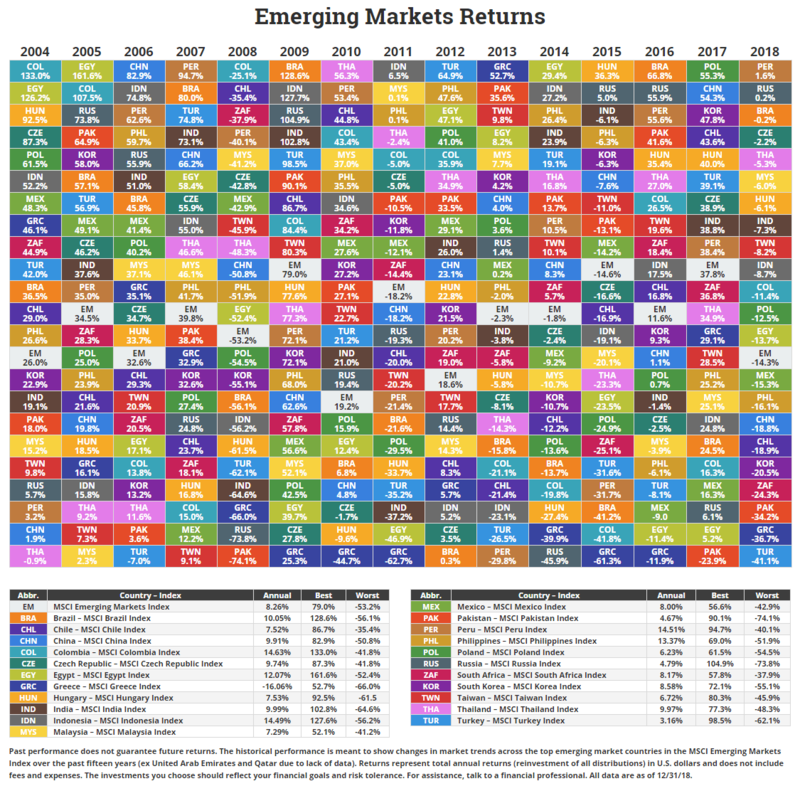 What about emerging markets? These fast-growing countries tend to have markets that are volatile, but as a portion of your portfolio they can enhance your overall returns. Again, as in the U.S. and international markets, trying to pick out winners in advance is a fool’s errand. 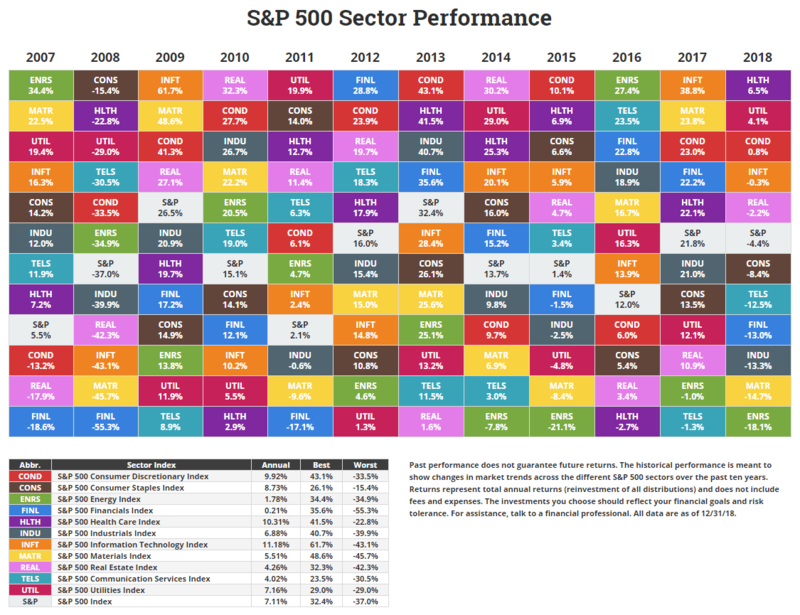 Maybe it would be easier picking what sector of the economy will likely outperform. That’s wishful thinking. The moral of this blog is that trying to predict winners and losers from year-to-year, in our opinion, is a waste of time. 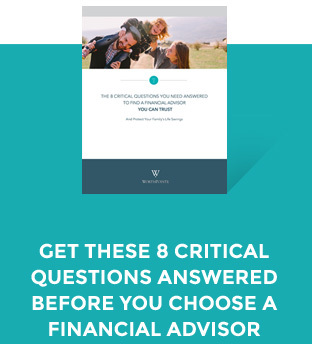 Having a globally diversified portfolio tailored to your goals, ability and need to take risk is more likely to lead you to a satisfying outcome. Certain information herein has been obtained from third party sources and, although believed to be reliable, has not been independently verified and its accuracy or completeness cannot be guaranteed. No representation is made with respect to the accuracy, completeness or timeliness of this document.